My inbox probably falls right in between the worst offenders you mentioned and your inbox. Hm,I am one of those people with a million emails. How do you do it? I am with you on this. 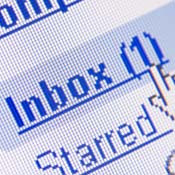 I am a chronic, habitual, maniacal email/inbox cleaner & checker. I also hate to see a computer desktop with a bunch of folders and stuff all over it! My daughter says I have borderline OCD traits but I just hate the clutter! Same here I always received bunch of emails everyday. I'm not subscribing any newsletters. I'm wasting my time deleting those unfamiliar email. Woohooo! I've developed a system as well. I am constantly slammed with PR request. The bulk of my emails come from that, but I have labels all willy nilly to catch them and put them where they belong. I freak out when I open mine and there are there are upwards of 50-something in there. Drives me crazy! I delete most of them, jokes, friend lovey e-mails, its all crap. I wish GMAIL had folders. My inbox is CRAZY!! !